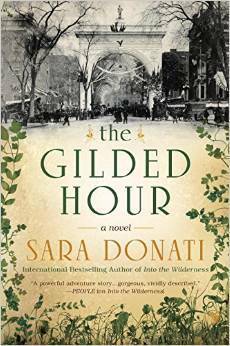 Today I'm featuring an upcoming read, The Gilded Hour by Sara Donati, which I borrowed from the library. Early on a March morning on the cusp of spring, Anna Savard came in from the garden to find a young woman with a message that would test her patience, disrupt her day, and send her off on an unexpected journey: a harbinger of change wearing the nursing habit of the Sisters of Charity, standing in the middle of the kitchen. The opening lines of this historical novel have me quite curious as to the message about to be delivered--it sounds like it will be life changing and far reaching. First Chapter ~ First Paragraph #138 was originally published by Catherine for bookclublibrarian.com. This post cannot be republished without attribution. Retweeting and sharing on Google+ encouraged.